In this series, Tidbits from Church History, we will take many brief glances into the past and will discover much that will inspire, encourage and strengthen our faith. God’s providence throughout the history of the church forms a beautiful tapestry. Only in eternity will we see the glorious things that God has wrought. I look forward to your feedback on Tidbits from Church History and seeing this family worship podcast blossom into something useful in God’s glorious kingdom. There are many reasons why we should invest time to learn about our family history. God has a remarkable track record of mighty deeds performed on behalf of His name and His people since the foundation of the world. Here are several thoughts from Tim Challies on why we should study church history. The Bible continually exhorts believers to search out and remember the past. The Old Testament in particular is filled with references to God commanding the Israelites to remember His deeds of the past. He instituted ceremony after ceremony, festival after festival, that caused His people to look to what He had done in the past. Veiled in many of these ceremonies and festivals was a glimpse of what would happen in the future. And so, when we look to the past, we may also glimpse just a little bit of what God promises us in the future. We should study the past to understand the present. The study of history, when done right, is always a humbling experience. It allows us to understand and sympathize with the plight of those who came before us. It helps us understand the blessings we enjoy today that were not always enjoyed by our brothers and sisters in days past. It also prevents us from developing a view of the faith that is too narrowly focused on our day and ignores the long, storied history of the church. It shows us that we are not too far different from so many of our brothers and sisters in days past and helps us avoid sins and mistakes they may have made. History is not just a study of the past in an attempt to understand the present, but is also an attempt to understand and even predict the future. When we see the patterns of days gone by, we can begin to formulate ideas about where current trends will lead. By understanding the past we begin to understand the future. When we understand where our current trends are taking us, we can react to avoid heading down paths that have been shown to be ruinous. As Christians we are often guilty of dwelling in the present and looking eagerly to the future while forgetting all about the past. But to do this is to lose sight of the valuable teaching of the past. In past days God revealed Himself in mighty ways, continually providing for His people through trial and persecution. When we study the past, we can see many of the ways in which God’s providence has already been displayed. This can serve as a valuable teaching tool as we prepare to face trials or persecution in our day. It can and should spur us to greater love and appreciation of God and give us greater confidence in His promises. As He has been faithful to men and women of days gone by, He will be faithful to us and to our children. This assurance gives us great stability in our faith. In many ways the history of the church is a history of action and reaction. Much of Christian theology has been developed and strengthened in reaction to error and heresy. When we visit the past we can see how error has arisen in the church and we can see which errors have already arisen and have been decided by a consensus of the church. This can be valuable as we face the inevitable error in our own day. Many Christians engage anew in battles over doctrine for which they could receive a great deal of guidance from great theologians of days past. By studying what has happened, we can avoid future errors and even the patterns that precede error. We all enjoy considering who we would choose to sit for a meal with, were we able to select from all the people who are living or have lived in the past. The reality, of course, is that we cannot speak with our heroes who have lived before us. Yet by studying history we can come to know and understand them. We can come to see the parts of their lives that brought glory to God and the parts that brought Him dishonor. We can see what led to their rise to prominence within the church and perhaps the character flaws that led to their downfall. We can learn much not just from history, but from specific people who lived in a period of history. Since Christ left the earth, Christians have lived in anticipation of His return. Those who lived in the first century expected that this event would be imminent. And yet, two millennia later, we continue to wait. As we look to history we arm ourselves with the knowledge that Christ’s return may still be far off. As we see how men and women have persevered throughout the history of the church, we are strengthened with endurance, knowing that we, too, shall be witnesses to Christ’s return when that great day finally arrives. 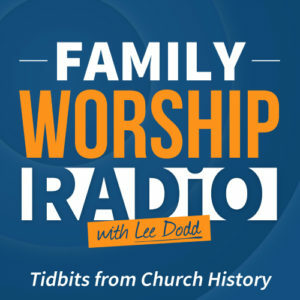 Listen to Tidbits from Church History episodes @ FamilyWorshipRadio.com.